For several years now the village Christmas Tree has not been what most residents and visitors would like to see. Whilst Father Christmas obviously exists, it is not his elves who put the Christmas Tree on the village green. In fact, I'm not even sure who does fund it, but it may be the Parish Council. Anyway, whoever it is, I am sure they do their best with the resources they have. Even though the time of year is magical, getting the tree there at all, costs money. Added to this, volunteers give their time to erect the tree on the village green, including Simeon Morgan from Aubrey Farm who has been up with his team and heavy equipment to help out in past years. With the Christmas Tree being so large, it is difficult to make it spectacular without a significant budget. In 2016 village based interior designer, Val Plummer personally donated a new set of lights to improve the tree for all. Her generous donation was welcomed and made the village centre that little more bright. 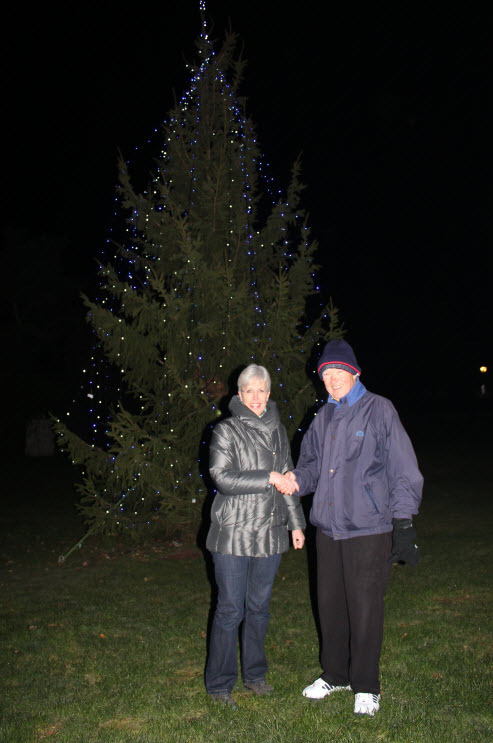 This year Tracy Haupt approached Graham Wells at the Parish Council (who has been very supportive) and he agreed she could help to oversee the lights going on the tree this year. Tracy saw this as a start to making the tree look more attractive for this year. She then spoke to a number of her friends (Diana Brushwood, Denise Gardiner, Eileen Maycock, Mayve Larke, Shelagh Richardson & Judith Say) and they decided to make 100 sparkly silver bows for the tree. These would be quick and easy to make and relatively inexpensive too (the cost of the ribbon and floristry wire came out of their own pockets). Ultimately, the team have now made 100 bows - 50 sparkly silver and 50 of the red and white. Plus, some very large bows - not sure how many but probably 35/40. 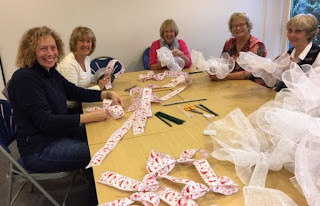 The tree is being delivered to the village on Tuesday 5th December and the ladies will be there to attach their bows. They’d like to have done far more, but with the limited resources and time left, will do their best to improve the look of the tree for this year. LtoR: Tracy, Denise, Diana, Mayve and Judith. Looking ahead to 2019, they would like to see representatives from various local associations and schools coming together to set up a ‘Xmas Decoration Committee’. This group would decide on how best to decorate the village and tree and the funds required. Meeting initially in April/May would allow plenty of time for the making of decorations throughout the summer, getting the whole community involved. An official donation page could be set up to raise funds from residents, associations and local businesses and that way, we could decorate this wonderful village to a level we would all be so proud of. It is exciting that our village Christmas Tree will be a lot more sparkly this year and if you‘re interested in helping the ladies grow this project further, by joining the ‘Xmas Decoration Committee’ then please let Graham in the Parish Council know. He’ll keep a list of names until the first meeting is called. Come along to see the Christmas Tree in all of its glory anytime, and take the opportunity to buy your Christmas treat or gifts from the village shops, or to make it a bit special, join the crowds for Carols on the Green This Friday. The band starts at 5.45pm to be following by the carol singing about 6.30pm. (7th December). The shops will also stay open late.